I'll eventually give a full update on my game but here's a quick tibit. Lamont Banner is the GOAT hands down! At one point he held the featherweight, lightweight and welterweight titles at the same time! He has multiple defenses with all 3 belts. I stripped him of the welterweight belt because defending all 3 caused a division being held up. His record is 37-0. The vast majority of his wins are knockouts with only a handful of decisions. Recently his fights have been all first round knockouts. Some only needed one or 2 strikes. Has anybody had similar success with him or any other fighter? I look at the posts and see Banner has actually lost in some saves. He was nowhere near as good in my GAMMA save. I do not have the game open right now but I recall him being very streaky in my game. He would win three in a row and then lose two in a row. I know his losses were in the double digits because I remember being disappointed in how bad he was doing when compared to how he did in my WMMA4 games. The Beast Kapur is the MVP in my games. He's been dominating for a long long time. Banner was the boss at FW but got beaten at LW several times. Those stats though... Will post a full report on my GAMMA game when it dies down and I let the AI take over (when the top stars retire that's when I do too). As of now, my two biggest draws in Matthew Dean and Spencer have left after their contracts expired due to hiatus, so thats a blow. Sorkin cant win title fights, Lamont does well in a weak FW class in my game, Flyweights are a wild wild west and Pamela O'neil is being built as my Ronda for the inclusion of more women in GAMMA. I finally got Diego to a top welterweight after him demolishing Silva and I think he might just run the division for years to come seeing how weak it is right now. He was a little bit of both in mine. He started off really strong winning the FW title but he promptly fell off and was just top 20 level. Sorkin cant win title fights, Lamont does well in a weak FW class in my game, Flyweights are a wild wild west and Pamela O'neil is being built as my Ronda for the inclusion of more women in GAMMA. Lamont can be booked as a McGregor of sorts in that division, where the only real contenders are basically lesser versions of him. Sorkin can't cut it in WMMA5 with his weak chin and should just drop in the rankings. He's currently picked up by ALPHA as he went 9-12 with me before I fired him. Good luck building O'Neill up as your "Rousey". I've simmed/played several games, but she never even improved 1% in clinch or ground skills so she'll never be Rousey (but I assume you mean Rousey as in your "big game player", which she is). Maybe I've just gotten unlucky but it seems her progression is locked to her striking, which is why she dominates usually. She is currently the highest grossing fighter in my game with 15.7 million earned, probably because she fights very often. Last edited by Blackman : 08-06-2018 at 07:38 AM. While running my master mod for my Womanly Art project, Natalie Blanchard who is my number three fighter in the WCL Featherweight Division got sent to jail via an assault charge for a year. Apparently during a post fight party at a Los Angeles nightclub (after knocking out Beth Browning at WCL 23: Clayton vs. Sparrow) Blanchard got into a brawl with another woman and the cops were called. My God. 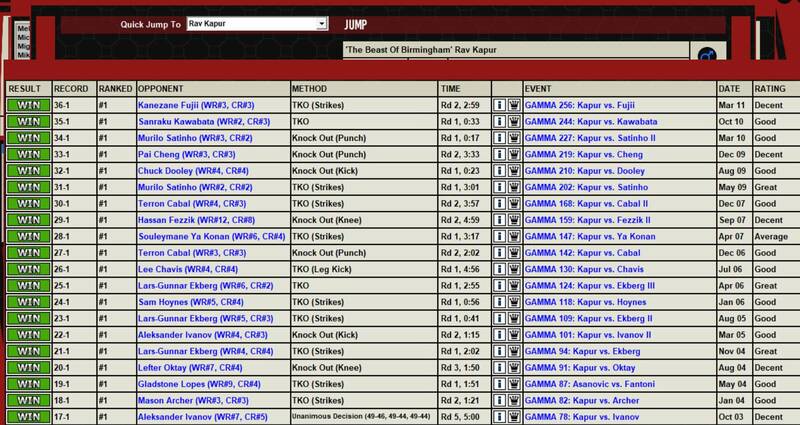 I hope Kapur in my game can do this as long as he has in yours. Right now Pamela is low level international and i have a pretty weak womens bantamweight class for her to dominate for a while until I need to grab the actually good ones from WEFF. I;ll always be upset Sorkin couldn't cut it, even with Spencer and Watson taking 2 year breaks, the guy was easily taken apart by a Marlon John who hadn't won a fight in a year or so. 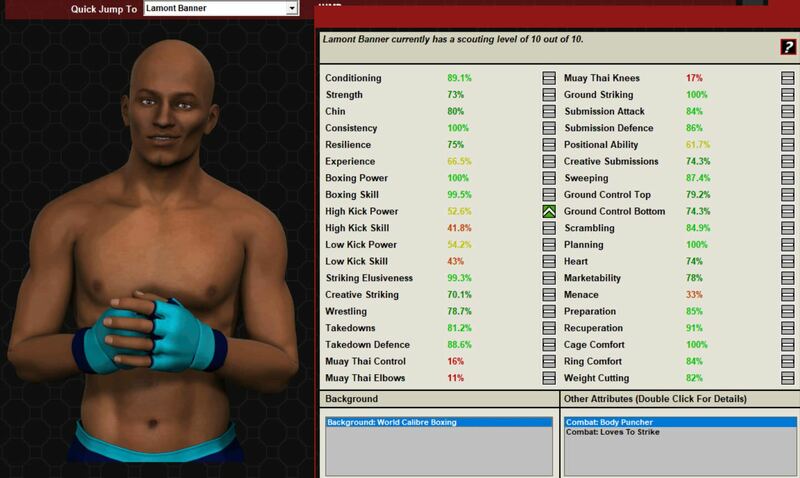 Lamont has dominated some top tier featherweights so far. I was most surprised to see HO lose so easily, but then again he hasn't been the same since WMMA3. And Isiah Monore loses to a low ranked Middleweight, setting back my plans even more. Take you Monore. You mean Thump? Unfortunately he's one of my game's TRT users so I let him go. BCF picked him up and he's #6 in the division right now. I'll sign him back next year. I meant of course a decade of dominance. Silly me. And it goes on as he beat #2 Joshua Hope. First round TKO. What a Beast indeed. Pam is declining early and has suffered a surprise loss to Gill. Not surprising given her chin has deteriorated faster due to fighting more and her grappling is even worse than that of the strikers she faces. I've gone to a schedule of weekly events now due to having almost each weight class in existence (so basically 1 more than UFC as I don't have the men's FlyW but have SHW and SW). Here's O'Neill's track record. Before this she had an undefeated streak from her loss to Vaughan onward. He's set to fight Robbie Lyn in a month or two in Lyn's hometown and I'm not sure if he'll win. He never got further then #7 P4P in his quest to become no1. Granted: if you look at his opponents, they are no joke. Silva was #1 P4P (which is saying a LOT as Kapur is superdominant and undefeated), Atep and Helio were both #2 P4P at one point. You can criticize me for "forgetting" the Ho matchup. I really did forget. Dudok is currently FW champ which also makes for a very attractive main event. So far no men have gotten a hold of two titles (just Pam). Not that many tried though. 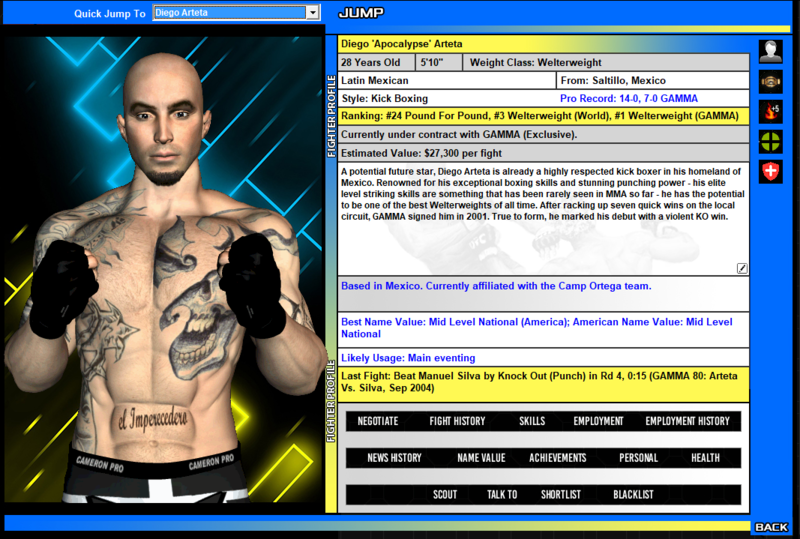 Well... Claremont succeeded but he got lucky as I tend to vacate titles after drug suspensions instead of going with a interim title. Last edited by Blackman : 08-08-2018 at 05:57 AM. Doing a Gamma save and having a reality show with a neat aspect of Team World vs Team USA (Weight class is Featherweight). Coaches are Nathan Chambers (Team USA) and Jens Halle (Team World) after Chambers called out Halle after his win against Josh Aldarisio. Hoping this will be a great season and the winner hopefully gets tremendous success! Edit: Heiko Pander and Wallace Everett will go at it in the finale. Last edited by Ultrakidpool : 08-09-2018 at 08:24 PM. After 6 years, I finally dethroned UFC (hard difficulty) as king of the MMA world. Elite Combatives Championship (ECC), over took UFC in early 2023. ECC was successful in coaxing numerous big talents out of retirement and eventually signed a few bigger names (Uriah Faber, Forrest Griffin) and signed a few veterans cast off by other promotions. ECC also hit on promising prospects like Tyler Diamond, Jim Crute, and Albert Tumenov who are all now prominent fighters at an international level. ECC grew into a giant by taking advantage of their own PPV provider which very nearly sent the company into bankruptcy but the gamble paid off and ECC started making millions off their monthly PPVs. This allowed them to begin poaching any available talent that caught their eye from UFC and Bellator. ECC just signed Conor McGregor to a "lifetime" contract which is good for 10 years or 10 fights.